During an astonishing three year period on the Eastern Front Erich Hartmann downed 352 enemy aircraft to become the highest- scoring Ace in history. It is a record likely to stand for all time. Posted to JG52 over Russia in August 1942 his new Kommodore, Dieter Hrabak, placed the novice pilot under the guidance of ‘Paule’ Rossman, one of the unit’s most experienced and respected Aces. However during his very first combat Hartmann became so disorientated that he got lost in cloud and ran out of fuel. His undoubted skill as a pilot enabled him to survive the inevitable crash-landing, but a few days later and just minutes after scoring his first-ever victory, he was shot down – again crash-landing. This time he only just escaped from his burning aircraft before it exploded. Any other new pilot might have succumbed but Hartmann was made of sterner stuff and, with Rossman’s help and guidance, it wasn’t long before everyone in JG52 realised that he possessed exceptional skill. By the summer of 1943 ‘the Blond Knight’ and his colleagues were flying up to six missions a day and having now perfected his technique, it was unusual for him to finish a day without a victory. Never claiming to be an expert marksman, his approach, which took nerves of steel and great flying skills, was to get as close to his enemy as possible before opening fire at the last minute. Often flying ‘head on’, the risks of collision and damage were great – of the sixteen times Hartmann was brought down, eight were as a result of flying into the debris of his victim! Hartmann’s 352 victories were achieved with JG52 – all except one. It happened during a brief two week spell at the beginning of February 1945 when the top Ace was placed in temporary command of I./JG53. His new unit were based in Hungary where German Army Group South was in bitter retreat and the fighting was as tough and relentless as ever. 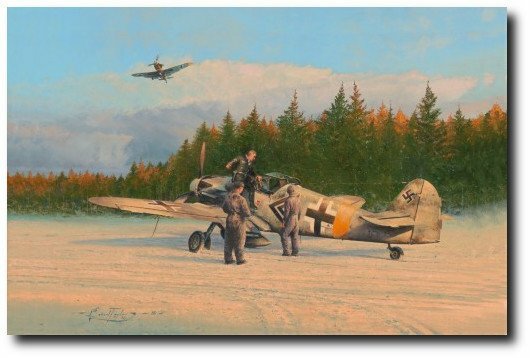 Following up on HUNTERS AT DAWN this is the second release in the pair of limited editions and Robert Taylor’s atmospheric painting portrays Erich Hartmann climbing out of his Bf109 G-6 at Weszperem’s snow-covered airfield after returning from another arduous mission leading Stab I./JG53 with whom, on 4 February he downed a Yak-9. It was his 337th victory. Adding great significance to this superb release, the edition is signed by iconic Luftwaffe Aces who flew on the Russian Front, and part of the edition includes the original signature of Erich Hartmann – the Ace of Aces! Each print is issued with an ORIGINAL PENCIL work specially created by Robert Taylor. The drawing is signed by four Luftwaffe fighter Aces who flew on the Eastern Front and conservation matted to include the original signatures of three more, including Erich Hartmann. The pilots included in this historic edition amassed a staggering total of 1000 victories between them!